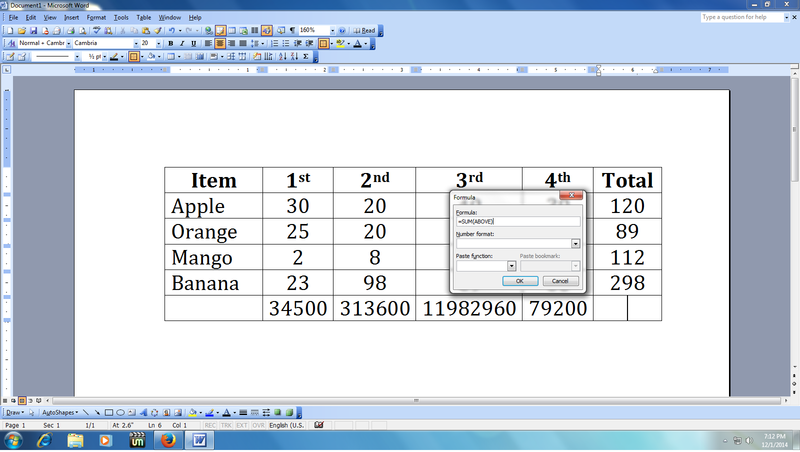 Not only in MS Excel you can also do calculation in MS Word like, sum, product, average, percentage, divided etc. etc… In MS word the calculation formula will work in table format only. You have to type formulas to get result for example in the table if you want to do “product/sum” keep the cursor end of column or row and press “Alt+A,O” you will get the formula box and you can change “product to sum to average” and you can also change “left to right to above” as per your need and press “enter”.. Please see the below video tutorial… it’s little hard to explain in text. Great artile, besides you can use MS Word templates to make your work with it more comfartable and easy, here is the link http://www.word.poweredtemplate.com/word-templates/free/0/index.html try some and I'm sure you'll be glad about using them. Good luck.